Damn my infernal pants pockets. The salesperson at the store said they would be useful for storing small personal items—car keys, loose change, lint—but he didn’t warn me that they’d be a crappy place to keep my smartphone. Somehow, some way, whenever I need my phone the most, it’s lodged deep in my front pocket, entrenched and inaccessible. Sound familiar? Indeed. 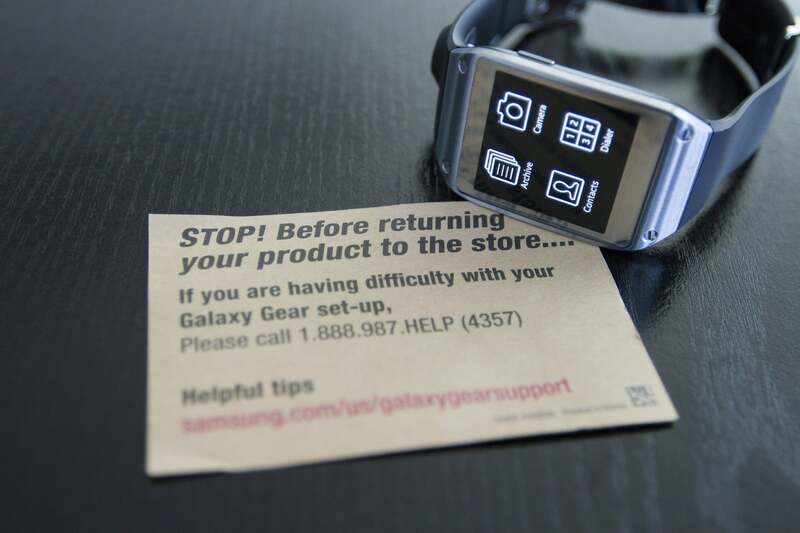 So a smartwatch such as the Samsung Galaxy Gear would seem to solve a lot of problems. In theory, it puts a bunch of critical smartphone functions on your wrist, saving you the trouble of extricating your phone from your pocket to make a phone call, snap a photo, or run a few apps. Well, that’s the promise at least. 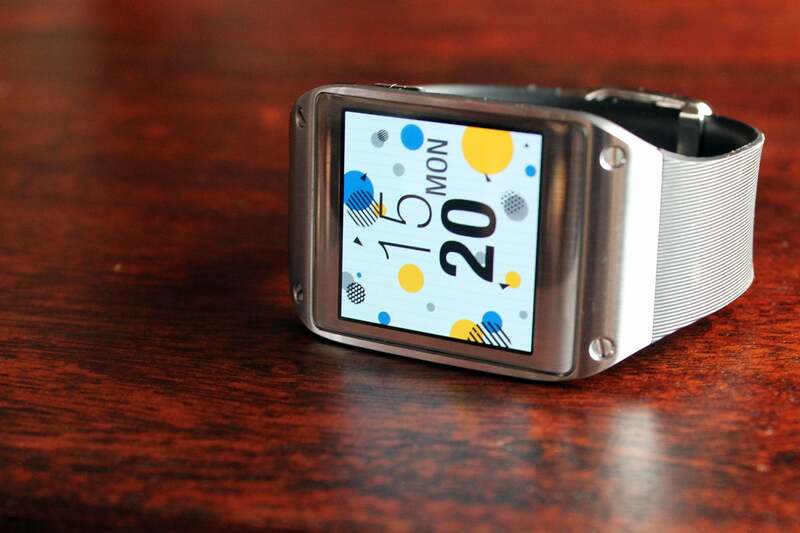 In practice, the Galaxy Gear hints and teases at what a great smartwatch could be, but never really nails any single function. It’s packed with potential, and it even includes support for third-party apps. But it’s a challenge to use at nearly every turn, and at $300 it feels like an expensive experiment. This is not a very encouraging leaflet to discover as soon as you unpack your new smartwatch. The Gear is not a stand-alone product—it requires a Bluetooth connection with your smartphone to execute almost all tasks. And it doesn’t work with just any old smartphone. At launch, the Gear works only with a single phone, the philosophically polarizing, 5.7-inch behemoth that is the Samsung Galaxy Note 3 (though conventional wisdom says support for Samsung’s Galaxy S III, S4, and Note 2 is coming). Still interested? Then take a good, long look at the Gear’s design, and ask yourself if this watch is anything you’d wear throughout the day. The watch fits my wrist just fine, and I personally find its styling to be inoffensive, if a bit techy-cheesy. But the consensus among women isn’t so generous. At launch, the only smartphone that works with the Gear is Samsung’s own Galaxy Note III. First, the Gear is too big for many women’s wrists. Second, more than half of the women I polled deemed it a fashion faux pas. Vintage analog men’s watches can make “cute accessories,” but Samsung’s interpretation is a different thing entirely, it turns out. “It looks like a prop from Battlestar Galactica,” said one of my female friends. And don’t even think about switching the band, as Samsung’s band includes the Gear’s 1.9-megapixel camera, an integral part of the watch’s feature set. The bottom line is that anyone interested in the Gear must be simpatico with an extremely niche smartphone, and have man-sized wrists and a high threshold for shiny brushed metal. Still with me? Then let’s continue. 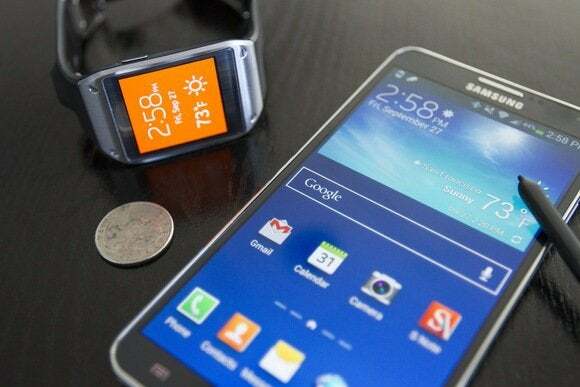 The Gear features a 1.63-inch, 320-by-320-pixel Super AMOLED display and a single-core, 800MHz processor. The display is too small to support an on-screen keyboard, so the Gear handles all data entry (if we can call it that) via S Voice, Samsung’s virtual digital assistant. With simple voice-recognition commands, you can do things like check the weather, schedule a meeting, and get the time in another city. When the feature works, it’s a pleasant convenience. But it didn’t consistently recognize my very … carefully … enunciated … words. Google Now on my HTC One works more reliably, and every time S Voice failed me, I lost confidence in its overall ability to perform. Samsung’s S Voice feature lets you use the Gear for hands-free access to phone functions. In theory. Samsung rates the battery life at a stingy 25 hours, but I found that it reached its low-battery warning message (which kicks in at 15 percent capacity) after about 11 hours of moderate use, two days in a row. Mind you, I wasn’t using the Gear continuously. Instead, a few times every hour I briefly shot some photos, sent some texts, explored a few apps, and made some phone calls. It’s worth noting that when a smartwatch runs out of juice, you don’t lose just the smart functions. The display dies, and you lose the ability to even tell time. At this point, you really need to appreciate the shiny brushed metal, because you’re wearing nothing more than an expensive bracelet. The Gear’s touchscreen display remains off by default, but thanks to a built-in accelerometer and gyroscope, you can (theoretically) wake it from sleep with a shake of your hand, or by turning your wrist and looking at the watch face. When I tried it, shaking the watch almost never cajoled the display into action. The wrist-flip maneuver was much more reliable, but not consistently perfect. During testing, I often had to suffer the indignity of waking the Gear by pushing its home button. Yuck. Regardless, once the device is ready for business, you can swipe the home screen left and right to access various functions. You get a voice-memo app for five-minute audio recordings; a media controller for whatever music app you’re using on your phone; a pedometer (whose step counts are available in real time, and appear entirely accurate); and menus for Contacts, Settings, and Apps, among other less glamorous features. Via Samsung’s Gear Manager, you can download much more dazzling watch faces than what’s built into the Gear by default. You can customize your home screen with scads of different clock faces, some built into the watch and some downloadable via your phone’s Gear Manager utility. The faces range from traditional analog designs to modern digital styles, and the best ones integrate app shortcuts. For example, the “Weather clock” connects with your phone’s location services to show the current temperature. Tapping the temperature kicks you into the preinstalled AccuWeather app for a six-day forecast. But I chose the “Shortcut clock,” which lets you pin three different apps to the home screen. This clock will likely be a popular choice, as most programs are otherwise buried in the Gear’s Apps menu and require excessive menu navigation to reach. And that’s a general problem across the entire Gear experience: The display is so small, it doesn’t have much screen real estate for user interface elements, be they effective or clumsy. So you end up swiping through multiple menus, doing your best to remember whether features are hidden on the watch or in your phone’s Gear Manager. The whole setup is riddled with logic loops, but that’s what you get when you try to stuff a modern mobile UI into the footprint of a large postage stamp. Thankfully, accessing two key features couldn’t be easier. Swipe down on the home screen, and you drop straight into the camera app. Swipe up, and you go to the phone dialer. It’s these two functions that speak to the potential of what a better smartwatch might look like. Can you hear me, S Voice? Hello? Because the Gear has a speaker, noise-canceling mics, and Samsung’s S Voice feature, it goes a step beyond the functionality of smartwatches from Pebble and Sony. When one of your contacts calls your phone (well, your giant Galaxy Note 3 phablet), a notification appears on the Gear, showing the face and name of the person calling. You can accept the call with a swipe gesture, and then begin talking directly into the watch. Behold the phone dialer that you have to use if S Voice fails you. The phone function should be a game-changer, but poor sound quality taints the experience. The speaker can’t cut through the din of even marginally noisy environments, and when you max out the volume, the speaker gets buzzy with distortion. Making a call is also a challenge: S Voice enables a semblance of hands-free dialing, but it’s not foolproof. I have S Voice pinned as a home-screen shortcut, so invoking the feature entails just a single finger tap (double-pressing the home button also activates S Voice). From there, you wait for the microphone icon to turn blue, and then you utter, for example, “Call Christopher Walken.” If you have Christopher Walken in your phone’s contact list, you’re off to the races, enjoying a rewarding phone conversation about how much you both love hot dogs. Well, that’s how it’s supposed to work. Oftentimes, S Voice couldn’t understand me, exposing the digital assistant’s struggles with difficult, multisyllable names, and windy, noisy environments. I found myself constantly repeating my words, reengaging S Voice, waiting for confirmations, and back-navigating to earlier menus. When it worked, I loved it. When it didn’t work, I found hands-free watch dialing more frustrating than just using my phone. The Gear’s camera lens is located on the band, where it blends in to the point of being invisible. When you’re taking shots in public, you appear to others as a person staring at his watch, making the Gear a photo-creeping system that’s even more subversive than Google Glass (a piece of hardware that announces its presence wherever you go). I appreciate the anonymity of memography, but encourage other Gear owners to use its powers for good, not evil. Pics max out at 1392 by 1392 pixels, but that’s more than sufficient for low-investment, moment-in-time image capture, and the image quality is surprisingly noise-free and color-correct. 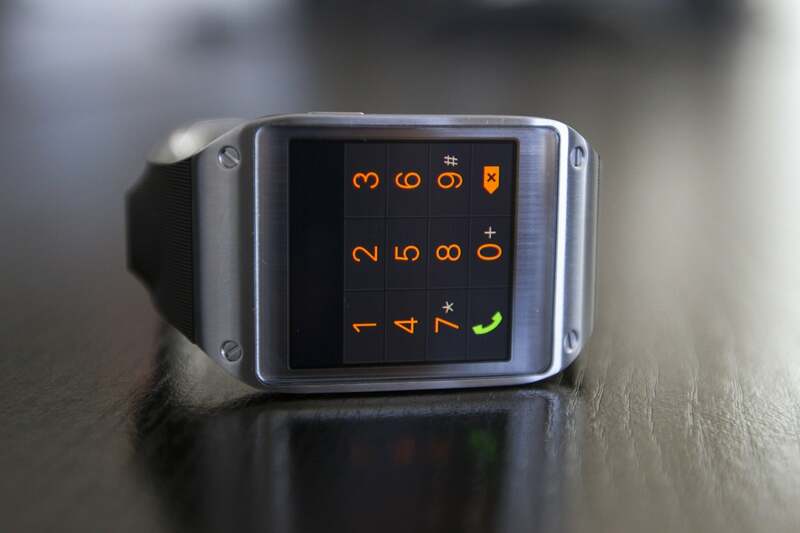 A hokey Galaxy Gear watermark is turned on by default, but you can kill that from the options menu. The camera can also shoot 15-second clips of 720p video, but you do so at the risk of consuming the watch’s 4GB of storage at a heartbreaking pace. Indeed, after shooting 50 photos, an on-screen message told me I had reached my maximum number of shots. To make room for more, you can transfer images to your phone over the Bluetooth connection—but that only drains battery life further. Unfortunately, the Gear can’t directly share an image via text message, email, Twitter, Instagram, or Facebook. You have to do all that fun stuff from your phone, which is a reminder that the Gear is something of a dumb terminal and also suffers a dearth of high-profile apps. Samsung says the Gear is launching with more than 70 apps. That might sound like a really small number, but I’ll argue it’s far too many. With the teeny-tiny screen, it’s difficult to display meaningful content on the Gear, let alone interface elements for navigation. Sure, you can use S Voice to maybe, hopefully enter text, but even reading text on the watch is a challenge. Maybe this is why Samsung didn’t include email functions. And maybe this is why Facebook, Twitter, and Instagram aren’t Gear launch partners. A crappy app experience is almost always worse than no app experience at all. Nonetheless, a handful of third-party developers have decided to throw down, and their apps (which you can download only from Samsung’s Gear Manager utility) range from meh to categorically lame. The Tweet Quickview app has serious problems with data density. You can’t see your friends’ names, let alone their messages. Take Tweet Quickview, an app that lets you read (but not send) tweets. The UI is crowded to the point of absurdity, and all embedded links are visible but not clickable. Or take Speedometer, an app that hooks into your phone’s GPS to report your walking or running speed over time and distance. It sounds good in theory, but do you really want to go jogging with a Galaxy Note 3 strapped to your arm? And because the Gear can’t multitask, you can’t have Speedometer running in the background while using other apps. Then there’s Vivino. Open the app and snap a photo of a wine bottle label. If the label is in Vivino’s database, you get a crowdsourced review rating, and information on food pairings. Sounds wonderful, right? Unfortunately, it misidentified two-thirds of the labels I scanned. Paradoxically, the one third-party download that didn’t disappoint me is SnapChat, an app I never use with my everyday smartphone. It works just as advertised on Samsung’s watch, though it’s missing a critical SnapChat function: Because of the positioning of the camera on the watch band, taking selfies is essentially impossible! But maybe that’s okay, because I don’t think that many teenage girls will be dropping $300 on this particular smartwatch anyhow. Confession: I had never even used SnapChat until I began testing the Gear for this review. Before the Gear launched, I was convinced I needed a smartwatch. But now that it’s here, I’m changing my story. Every time the Gear promised me something wonderful, it let me down with compromises. Want a beautiful screen and enough processing power to run apps? No problem. But you’ll need to suffer poor battery life in return. Want to make calls without using your phone? Got you covered. But you’ll have difficulty dialing contacts, and hearing callers once they’re finally on the line. Want to take photos with your watch? You can do that too. You just won’t be able to take many images, and sharing them with friends will be a chore. And the final insult? That dizzying $300 price tag—and that’s after you buy the new Galaxy Note 3. Jeez, really? Suddenly, fishing my smartphone from my pants pockets a bazillion times a day doesn’t seem so bad. 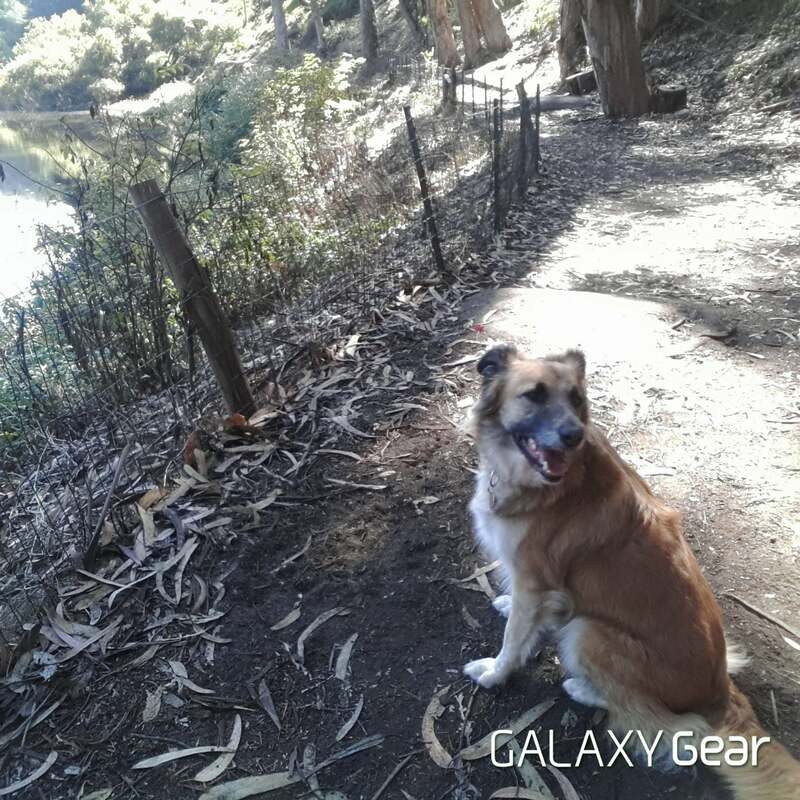 This story, "Samsung Galaxy Gear review: Meet the smartwatch that simply tries too hard" was originally published by TechHive.